Charyl I can’t thank you and your Mam enough. We just can’t believe that my Mam can hear again. She can’t quite believe it herself. I’m here with her now and it’s just so strange to not have to speak slowly and loudly to her. She can even hear us with her back turned!! She’s so emotional this is the start of a whole new life for her. I can’t convey in a text how very thankful we are. I never thought she would ever be able to hear again to the level that she can now and so quickly. Have you hearing problems? Or does a loved one? If so or are not sure check these fantastic people out. They have southside and northside premises. Their checks are thorough and they try to fit your budget. They have helped me enormously over the last10 years. Can’t recommend them highly enough. Judith, Charyl, Victoria… all of them. 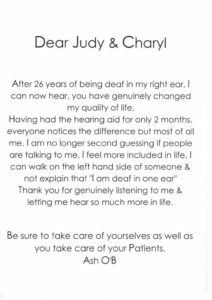 For over five years, I am a client of DAS during which time I have benefitted from Judith and Charyl’s un-ending professionalism, coupled with a willingness to always ‘listen’ with the goal of finding a solution to the challenges of my hearing loss. 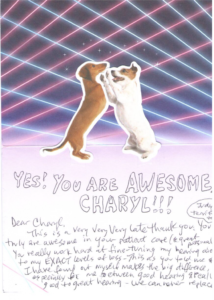 As hearing loss is such a personal thing; Charyl’s bespoke approach to finding the most practical yet optimum solution to my hearing challenges has been none other than inspirational. The relationship of trust is built from the fact that I consistently experience personal service and a solid support system that’s built from a foundation of always being at the cutting edge of hearing aid innovation. As someone who cannot live without my hearing aids; this is an invaluable advantage to me.